Cause-and-effect diagram: Also referred to as a "fishbone" diagram, an Ishikawa diagram, a causal diagram, and a herringbone diagram, a cause and effect diagram is highly useful to identify the causes of product defects and the causes of patient care problems and concerns. Flow chart: This chart displays the steps of processes and it is highly useful for identifying flawed and problematic processes and process steps. Check sheet: Used to both collect and visualize data. They may signal some frequency of events without performing complex statistics. Line graph: One of the simplest of all charts and graphs and one that has two axes; the vertical axis is referred to as the y axis and the horizontal axis is the x axis. Bar graph: A graph that is similar to a line graph, except a bar graph displays data with bars along the x and y axes and not lines like a line graph. Control chart: Also referred to as a Shewhart charts, this chart is based on the statistical data, which is unlike many other charts and graphs that are frequently used. Pareto chart: A combination of a bar graph and a control chart that displays data in descending order. Histogram: These graphs display frequency data in the context of its distribution. Scatter diagram: Also referred to as a scatter gram and a scatter plot, shows the correlations of two variables. Labels: Labels include the name of the graph, which tells you what the graph depicts and the names of the x and y axes in terms of the variables that they are represented. Intervals: Intervals are regularly spaced segments of a graph that are labeled to allow us to determine a precise or approximate value for each data point. Axes: The standard of graphing indicates that the horizontal line is the x axis and the vertical line of the graph is the y axis. Point of origin: The point of origin on a table, chart and graph is sometimes shown as a zero and sometimes it is left unlabeled but understood as a zero and referred to as 0,0 according to the Cartesian coordinate system. Cartesian coordinate system: Standardized terminology for the identification of coordinates, which are the points where a data point on the x axis and the data point on the y axis are identical. These coordinates are identified and labeled with 2 numbers separated by a comma. Quadrant I: One of the four quadrants in the graph that has positive numbers along the horizontal x axis and positive numbers along the vertical y axis. Quadrant I is the upper right hand corner of a graph with four quadrants. Quadrant II: One of the four quadrants in the graph that has negative numbers along the horizontal x axis and positive numbers along the vertical y axis. Quadrant II is the upper left hand corner of a graph with four quadrants. Quadrant III: One of the four quadrants in the graph that has negative numbers along the horizontal x axis and negative numbers along the vertical y axis. Quadrant III is the lower left hand corner of a graph with four quadrants. Quadrant IV: One of the four quadrants in the graph that has positive numbers along the horizontal x axis and negative numbers along the vertical y axis. Quadrant IV is the lower right hand corner of a graph with four quadrants. A map: A graphic representation of geography and the relationships between and among things, like streets or other places. The key or legend of a map: Information about the symbols found on the map. The grid of a map: The grid shows lines on the map that represent coordinates on the map, like some graphs do. The scale of the map: The scale represents actual distances that have become miniaturized on the map. The scale of a map tells you the ratio of actual distance to the represented distances on the map. For example, a map's scale may state �1/2 is equal to 5 miles or 1 inch is equal to 100 miles. The compass rose, or compass on a map: The compass or compass rose shows direction. Diagrams: Graphic pictorial representations of things. As the expression goes, "a picture is worth a thousand words." Graphic representations are pictures and symbols, such as those discussed in the section of this TEAS review which covered and addressed, tables, graphs, charts, diagrams in addition to maps are examples of graphic representations that one must be able to comprehend, understand and follow. For example, you should be able to identify the information that is contained in a bar graph and you should also be able to identify and apply the information that is on a map so that you can accurately move and navigate from point A to point B using a map. Read more about legends, labels, intervals, axes, and points of origin. Read more about tables, charts, and graphs. Like tables, charts and graphs, maps give us a lot of information that can be gleaned from them. Simply defined, a map is a graphic representation of geography and the relationships between and among geographic locations and other geopgraphic things, like topography and weather patterns. Maps can be classified and categorized in a couple of ways. Maps can be a hard copy on paper and they can also be digital and electronic as they are on the computer and on a GPS; they can also be static as well as dynamic and interactive and they can be used for a number of different purposes as based on the type of map. The key or legend which includes information about the symbols found on the map. Below is an example of a map legend or key. The scale of the map which represents actual distances that have become miniaturized on the map. The scale of a map tells you the ratio of actual distance to the represented distances on the map. For example, a map's scale may state �1/2 is equal to 5 miles or 1 inch is equal to 100 miles. Simply defined diagrams are graphic pictorial representations of things. 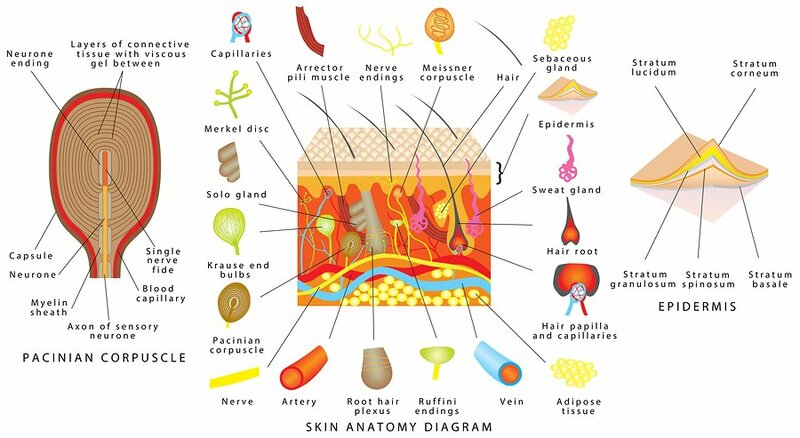 As you can see in the diagram above, the complexities of the skin in terms of its anatomy are clearly shown and labeled. A diagram such as this one enables us to identify, comprehend and more fully understand the anatomy of the skin when compared and contrasted to a strictly narrative description of the anatomy of the skin.